"I'm sorry that my cancellations have been the source of much disappointment and frustration in recent weeks. Of course, I can understand the irritation of all those who organized expensive trips to come and listen. Unfortunately, the performance of a singer's voice can not be guaranteed and sometimes a singer is confronted with events that require it to take a long rest. When I noticed that something was not right with my voice, I thought at first a beginning of infection. The medical examination has however given another result: side effects of a drug have broken a small vein on my vocal cords. So I have to stop singing until the hematoma has completely absorbed to prevent irreversible damage. So it is with a heavy heart that I have to cancel my performances Tales of Hoffmann in Paris. I want to thank here all those who have sent me their well wishes via Facebook and email." In additional news Roberto Alagna is having sinus surgery at the end of November. 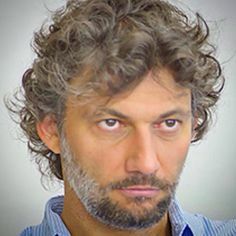 This will be missing Jonas Kaufmann who has that he has had a hemorrhage in his vocal cords. I'm still interested in the production. This is an excellent cast for this gem of bel canto. This is also an excellent cast and not to be missed. 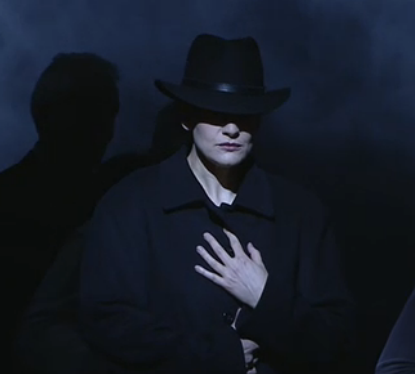 There are a lot of big names in German opera listed here including my favorite, Anja. 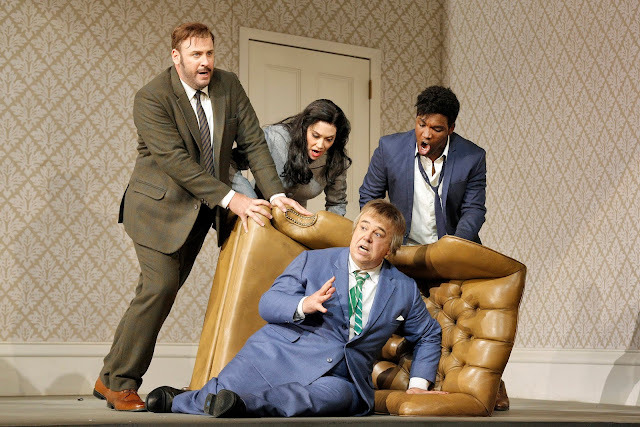 I knew there was something that looked familiar about this production of Donizetti's Don Pasquale. 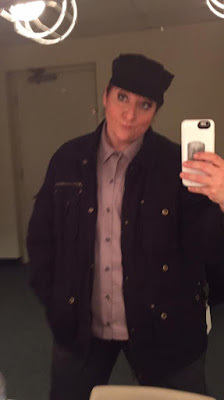 It is shared with the Santa Fe Opera. In Santa Fe there are no overhead flies and things often slide out from the sides. Well that's what this does. The colors are drab in the extreme and only brighten up later through the introduction of colored chairs and flowers. I thought it was functional but drab. Drab in a comedy doesn't make much sense to me. Laurent Pelly retained his credit but did not come out to bow. I suspect this is not actually his production. 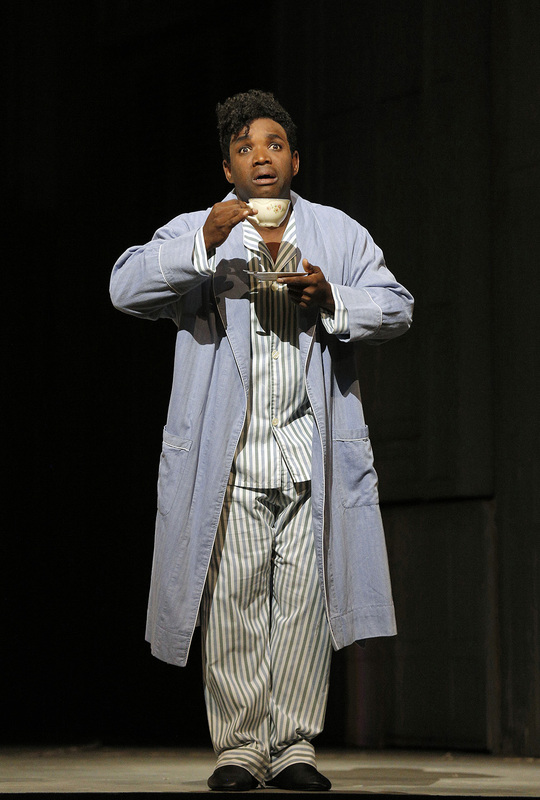 The highlight of this performance was the company debut of Lawrence Brownlee as Ernesto. He had the most slapstick comedy and performed it expertly. Besides being a fabulous singer. We loved him. 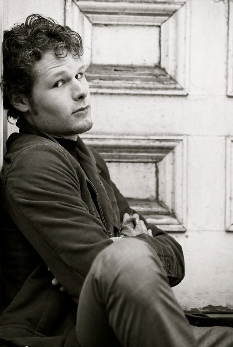 He was well matched to Heidi Stober, by now a company favorite. Larry, please come back. It was in fact a fabulous cast. Everyone met and exceeded expectations. This is my list of where I have seen these people. For me the fabulous singing actors saved this. But then don't they always? The intermission was extended by about 20 minutes without explanation. Footnote: the program cover showed a picture of Gina Lollobrigida. Think all the good thoughts you can summon for Dmitri Hvorostovsky as he begins more chemo. 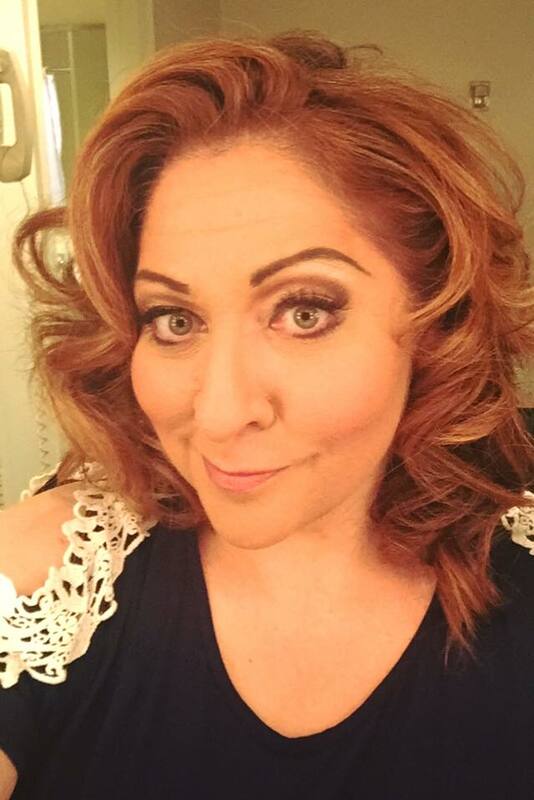 In the summer of 2018 Wagner's Ring returns to the San Francisco Opera. Maybe I'll get to see it this time. There is a press announcement that tells the cast, but it's hard to find. Runnicles will conduct. Here is Karen Slack on her first billboard. I've been blogging about opera for over a decade, and I love them all more and more. Stuart and Nina were amazing tonight. 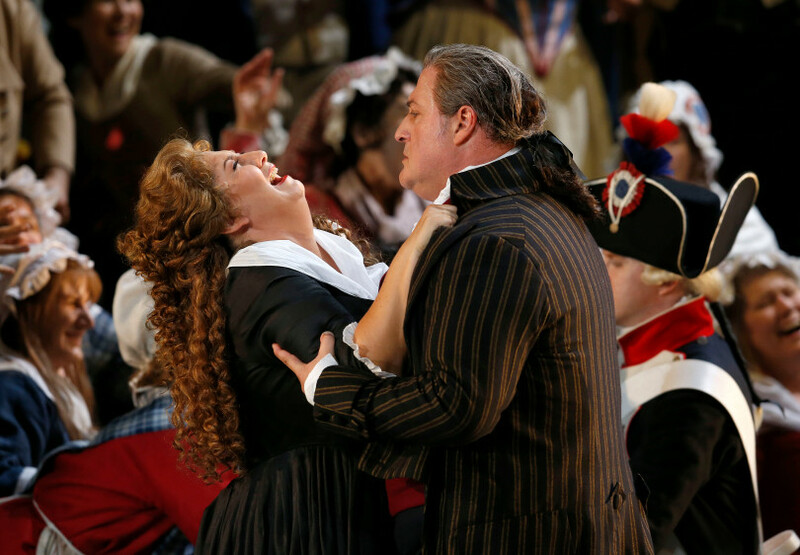 Giordano's Andrea Chénier from the San Francisco Opera was a real treat. The above performers with * next to their names were making their San Francisco Opera debuts. My favorites in order were George Gagnidze, Anna Pirozzi, J'Nai Bridges and Yonghoon Lee. 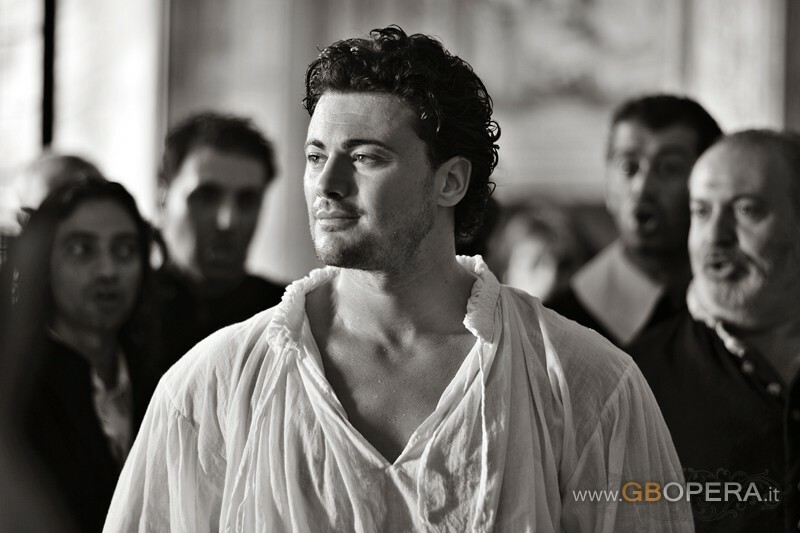 Gérard's aria in the prison scene was especially wonderful. I have seen Gagnidze a few times before. I'll try to remember him this time. This is an excellent group of debuts. 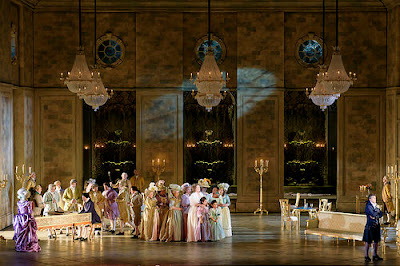 I saw this production in the film from the Royal Opera in London. I thought the final scene made a better effect here. I like the way the entire production looks. Most surprising was Anna Pirozzi who began her performance with a relatively small tone and continued to increase in volume until the really quite loud finale. It was thrilling. She was new for me. I have seen Yonghoon Lee before in Il Trovatore from the Met. I felt he handled Verdi much better than he managed Giordano. Chénier is a role that best fits a voice like Mario del Monaco while Lee seems to try too hard and creates the impression he is struggling. This is highly recommended from me. I enjoyed it very much. I went to the lecture where we were told that Maddalena actually got away. Sigh. The live stream of Die Meistersinger from the Bayerische Staatsoper in Munich, originally scheduled for July 31, is now scheduled for October 8. Unfortunately this is the same day as the Simulcast of Tristan and Isolde from the Met. Tristan can be watched the following Wednesday while streams from Munich tend to disappear immediately. 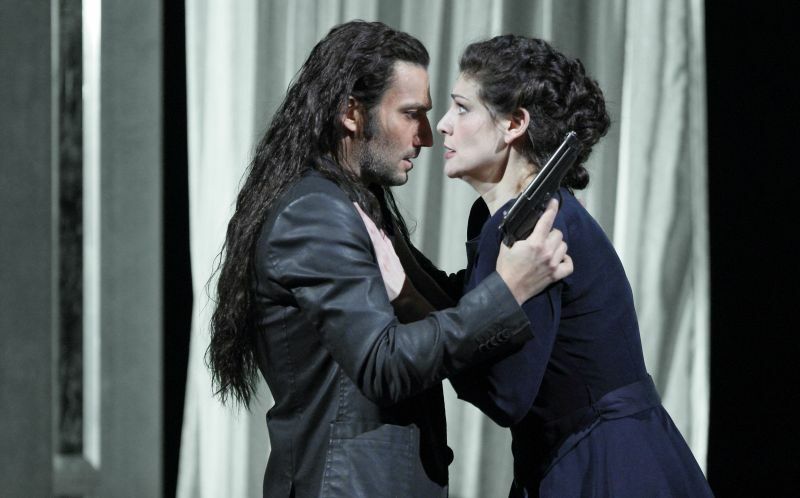 I am very sorry to report that this stream from Munich will not include Jonas Kaufmann. California State University, Sacramento is just across the river from my house. Their music department has recently been retitled a School of Music. Last night a group of guest singers presented what was for me an unusual concert. Would I know a parlor song if I heard one? Apparently not. The three singers grouped themselves in various combinations with only two groups of solo songs. There were two different female composers: Amy Beach and Mabel W. Daniels. I had at least heard of Amy Beach, but her songs were unfamiliar. As were the songs of the male composers: Edward MacDowell (not entirely unfamiliar), George W. Chadwick, Arthur Foote and Henry Hadley. The composers in bold were members of a group called the Boston Six, which also included Horatio Parker, a man whose works I have actually performed. So close and yet so far away. The songs were oddly international. "A Canadian Boat Song." "Bedouin Love Song." "A song from the Persian." I enjoyed "The Skylark" because it reminded that once in Europe I witnessed the mating song of the male skylark. They fly into the air and sing a long song while hovering in one spot. I digress. The songs were all lovely and performed in a very genteel manner. I have never been to Boston which may be why a concert of parlor songs seemed like a visit to an unfamiliar place. We are so well behaved. One might wish to go home and play some loud rock and roll. "It's nothing about the character. It's all about the music." Medici tv interview with Netrebko. Misc. eunuchs and ladies in waiting. Dream of the Red Chamber is an eighteenth century novel from China, and it is huge. Only the broad outlines of the story are selected for presentation here. This is the world premier of this opera at the San Francisco Opera. I am going to try to describe the plot in my usual way. The story begins like the Wizard of Oz in a gloomy and drab environment populated by an older Monk who only speaks. He introduces the stone and the flower who wish to escape the bounds of their limitations and express their passion in the world of humans. The Monk tells us that he dreams every night of the red chamber, the place where women of the upper class live with their small children and servants. Adult men are not allowed, but we are then introduced to Bao Yu who has passed the age when young men are allowed to stay in the red chamber. He refuses to go. We are to believe that he is the incarnation of the stone. He meets his cousin Dai Yu, the incarnation of the flower, and they fall in love. The wider world has other plans. His sister has gone to live with the Emperor and has been made a Princess. 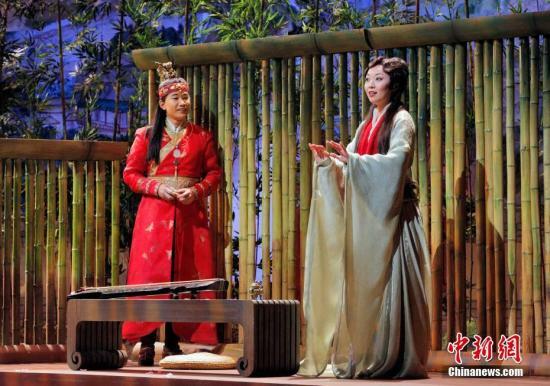 The Emperor wishes him to marry Bao Chai. This is the basic complication of the story. My only problem with the production to this point was in distinguishing the characters. Dai Yu has always a red scarf. Granny Jia and Lady Wang are also easy to distinguish. But which one of these lovely young women is Bao Chai? The point of the story is that we humans are not free. A stone or Rusalka or Pinocchio might imagine that it would be better to be a human, but humans have restrictions they cannot understand. Bao Yu is forced to marry Bao Chai. The Emperor seizes the property of both families and casts them out. The Monk meets Bao Yu on the road, shaves his head, and tells him he is himself as a young man. Dai Yu drowns herself in the lake. The Princess dies. I think it was a good choice for a story for an opera, but I sense a certain reluctance to fully commit to a western opera. The writing for voice was monotonous. Every phrase cannot be a climax. Perhaps other singers could shape the phrases to show more ebb and flow, but this seemed always high, always just a little too hard. Only Dai Yu was able to vary her expression. All sang this difficult music reasonably well. The philosophical conclusion seemed to agree with my own. The good of human life is found in art, poetry, music. This film (audio only) of Handel's Rinaldo is of a live performance by the Academy of Ancient Music on January 16, 1999. The cast is similar to the recording which came shortly after this except instead of David Daniels, we have Ewa Podles. I think I like it better. Make up your own mind. What are we to make of this? Too much time with Erwin? I saw this streamed from the Bayerische Staatsoper in 2013, and now it has come out on DVD. I am trying to decide if it makes more sense the second time around. Forza is a problematic opera. The music is some of Verdi's best. I think when I was young it was far more popular than Don Carlo. I can't say if this is due to the fact that it was one of Leontyne Price's more prominent operas, is in fact the only currently available DVD of a full length opera film of her in Amazon. The plot centers around the evil brother who is simply nasty for little apparent reason. Act I. Don Alvaro has apparently been invited to dinner. The family along with their priest wait around the table, but he doesn't arrive. His empty chair can be seen above. Ultimately he comes, and he has a gun. And somewhat more obviously he has hair. Papa doesn't like him, and we know why. He's a hippie, and fathers of girlfriends never like hippies. There's probably another back story somewhere. He tries to cool off papa and ends up throwing the gun on the ground. It goes off and shoots papa. This was very well staged. 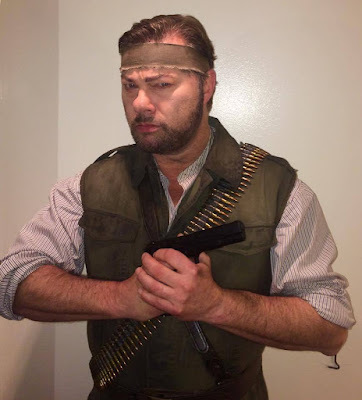 An open space separates papa from Alvaro, and he throws the gun out into the open space. One sees the flash. Usually this part of the plot is completely botched, and the audience has no idea what happened without reading it in the program. Here it is very clear. Papa curses daughter and dies. Act II. Separated from Alvaro, Leonora is at an inn where she sees her brother still dressed in his green sweater, though now he looks like Ludovic Tézier. This both works and doesn't work. It works because it tells us he is the brother from the previous scene. It doesn't work because the child in the previous scene is too young. He needs to be at least 16. Or why is he still wearing the same sweater after so many years? It's very dark and hard to see much of anything. The table is still there, and papa still lies dead on the floor. Leonora is still in her black dress, but seeing brother she slips into this mysterious disguise which she finds on the floor under the table in a case. Does this make any sense at all? The disguise may be the best part of the production, along with Jonas's hair. Preziosilla sings for the customers. She's recruiting for the army. Leonora arrives at the monastery and asks for entry. The table is still there, but papa no longer lies dead on the floor. Only a couple of chairs plus the cross from the table remain. The main priest at the monastery is the same singer as papa. They dicker, but eventually he gives in and lets her stay. They let her inside where there is a huge basin of water and a bunch of rag tag men in white suits. They submerge her in the water as in an immersion baptism, three times fast and then one time slowly. They perform the "La vergine degli Angeli." It isn't exactly Catholic, so perhaps a cult of some kind. This is one of the more gorgeous things Verdi ever wrote. Act III. This is the war act. When Don Carlo and Don Alvaro meet, they pledge eternal friendship because Alvaro has saved Carlo's life. When Carlo discovers who Alvaro is, he tries to kill him. Alvaro decides to go into a monastery, the same one Leonora is in. Act IV. The greatest aria of this opera is in this act: "Pace pace." Alvaro is hiding, but Carlo finds him anyway. Alvaro mortally wounds Carlo who manages to kill Leonora before he dies. 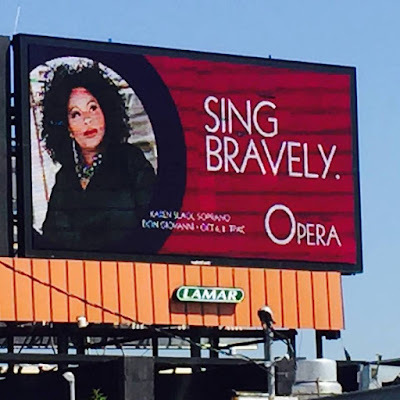 These three great singers do beautiful justice to this opera, but it still leaves a nasty taste in ones mouth. Daniela Dessi (14 May 1957 – 20 August 2016) This soprano crossed my path only once--at the Wiener Staatsoper in 2007 when I saw her in Manon Lescaut. I enjoyed her work, but she was upstaged by the production. She died of cancer. Johan Botha (19 August 1965 – 8 September 2016) Tenor Johan is another matter. I have seen him sing Otello, beautifully, and Tannhäuser. The latter was a towering experience for me. He died of cancer at 51. I'm compiling a list of active opera singers, and the number only goes up to 110 so far. I count only those I have heard at least once. This means they are a small family whose deaths we mourn. My favorite death music is here. I'm posting this because it is one of those rare instances where Cecilia and I sang the same repertoire. She always says she doesn't know from Bach, but this is just about the same as how I did it. Same tempo, and perhaps about the same age. I loved singing it. The selection is based primarily on photographs. I try to use pictures I haven't used before. 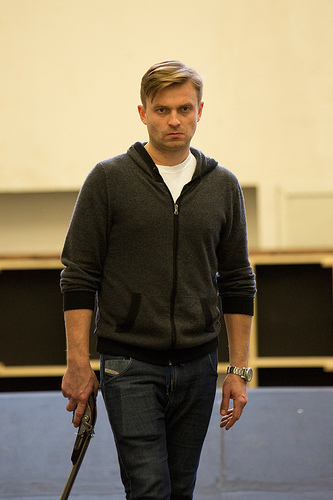 There are so many choices for Pavol that it is impossible to pick. Man with gun always works. This is next year's schedule for the San Francisco Opera. War horses are rather thick on the ground. 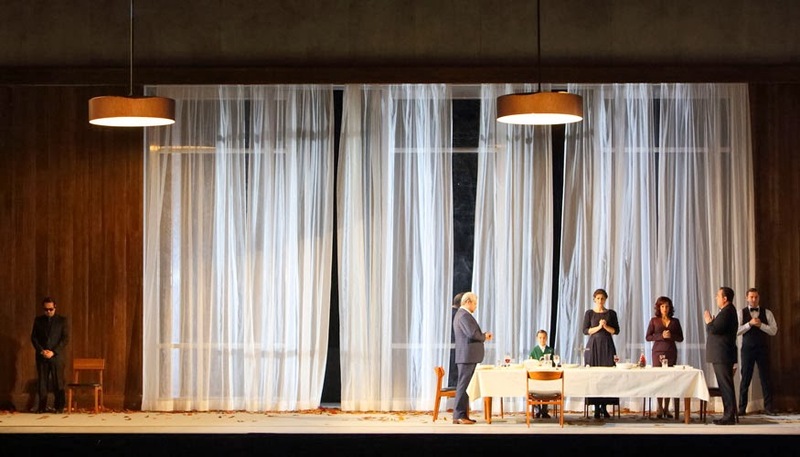 Of our 9 operas, 6 are from the top 20 most frequently performed operas and 4 are from the top 10. In an attempt to appeal to the masses, the company seems to be missing the point that the opera fans who form the donor base will be bored and disappointed. The season opens with Umberto Giordano's Andrea Chénier in a new production by David McVicar from the Royal Opera Covent Garden. This opera shows from September 9-30 2016 and stars Yonghoon Lee* as Andrea Chénier and Anna Pirozzi* as Maddalena de Coigny. Nicola Luisotti will conduct. This is a verismo opera and recently played in movie theaters in a wonderful production which we will also enjoy. Folks. It doesn't get better than this. Tony is also in top form. I like best the schmaltzy ones. I'm sure others will be able to find a lot of words, but I just let my heart go where it wants. I love Anna. She is one of my favorite singers. The reasons are many, but it has to have begun with her incredible charisma. I'm a long timer--my first encounter was a live performance of Ruslan and Lyudmila in San Francisco in 1995. I love the sound of her voice and think it only becomes more beautiful and her technique more spectacular. With this album she is at her peak. Her heart is always present in the music. For this she will live forever. This is Christine Goerke in her disguise as Fidelio at the Cincinnati Opera. Then she takes off her hat and looks like this. They're a couple of months old, but I still like them.